Ronald Reagan Washington National Airport, which was formerly called Washington National Airport, is situated in Arlington, Virginia. The airport is opposite Potomac River and just 3 miles away from downtown Washington D.C. This is the closest commercial airport to the District of Columbia and serves the metropolitan area of Baltimore/Washington. The largest carrier at Reagan National Airport is US Airways; and it offers flights to Logan International Airport and New York LaGuardia Airport. Delta Air Lines also offers shuttle flights to LGA. The airport received 20,415,085 passengers in 2013 with most of the traffic coming from US Airways. This was a new record for Ronald Reagan Airport in terms of passenger traffic. Enjoy big savings and have a stress-free experience with no hassles when you book and use our service. Reliable rental cars since we only offer deals from trusted car rental suppliers. Talk to any of our friendly customer care experts to help you find the perfect car rental at Reagan Airport. There are several ground transportation options at Ronald Reagan Washington National Airport. Most passengers prefer renting a car because it gives them the freedom to go anywhere they want, anytime they want. There are many interesting places one can visit in Arlington and you can find some of them listed here. The airport was renamed to Ronald Reagan Washington National Airport in 1998 in honor of the 40th President of the United States, Ronald Reagan. The national airport is managed by the Metropolitan Washington Airports Authority, which also operates Dulles International. The original Terminal, which is now known as Terminal A, was built in 1941. It is now included in the list of National Register of Historic Places. Reagan National Airport has three terminals: Terminal A with 9 gates and Terminals B and C with 35 gates. 1. Lay some flowers on the Tomb of the Unknown Soldier. Located in the Arlington National Cemetery, the tomb is just one of the places to visit in this cemetery, where many famous people have been interred. 2. Stroll Washington DC's National Mall. Loaded with monuments and glimpses of the White House and the US Capitol Building, a walk down the mall is a walk through some of this city's most beautiful architecture. 3. See some stars and the Smithsonian's National Air and Space Museum. Relax, sit back and enjoy a trip through space in the planetarium with the Air and Space Museum. Then sit inside a cockpit and get up close and personal with numerous rockets. 4. Take a pencil rubbing at the Vietnam Memorial. This memorial is a wall that has become a poignant tribute to those lost in the Vietnam War. Take paper and a pencil and rub one of the thousands of names of our fallen soldiers. 5. Go back in time at the Smithsonian's Holocaust Museum. This museum offers a realistic Holocaust experience for those interested in understanding this tragic aspect of our world history. This is truly a one-of-a-kind experience. Where to find cheap Reagan Airport car rental. Once you've arrived at the Ronald Reagan Washington National Airport, go to the first floor of Parking Garage A. 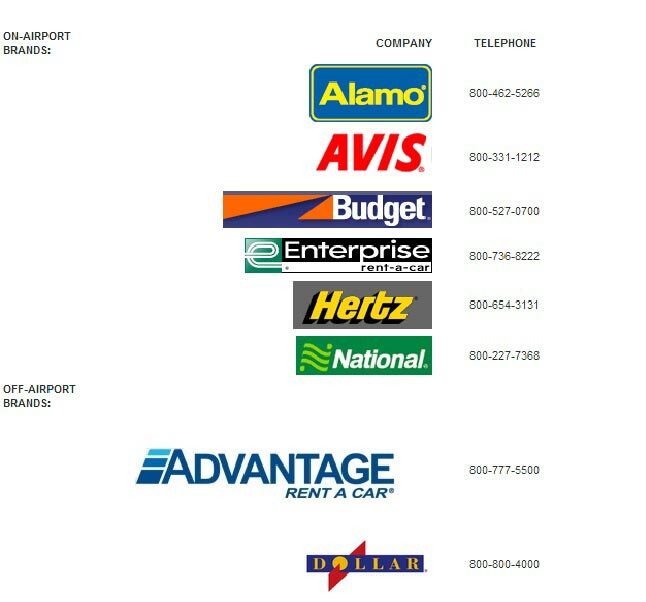 There you will find the counters of on-airport rental car brands Alamo, Budget, AVIS, Enterprise, Hertz, and National. If you are a club member of any of the rental car company mentioned, then you can go directly to the second and third floor of Parking Garage A. After booking or confirming the Reagan Airport car rental, ride the rental car shuttle to reach the concessions from each terminal. You can also walk from terminal A and terminal B to reach the car rental concessions. Just follow the signage or ask inquiry from the staff for further directions. Passengers also have an option to book from off-airport rental car companies: Dollar and Advantage. Make sure to call the company first to arrange a shuttle service to their depot. With today's advanced technology, most passengers prefer booking a Reagan National Airport car rental online. VroomVroomVroom compares car rental rates offered by some of the country's leading suppliers. This will save you time from choosing a vehicle and booking a car rental. No need to sign up or give out your credit card details to book a car rental Reagan Airport. The first major terminal in Washington D.C. was Hoover Field, which opened in 1926. A year after it was established, another air field was opened next door and it was called the Washington Airport. The Depression resulted in the merge of the two terminals in 1930; thus it was called the Washington-Hoover Airport. U.S. President Franklin D. Roosevelt allocated $15 million to establish a National Airport. They started building the Washington National Airport in 1940 and it was completed on June 16, 1041. The 32nd President of the United States was present during the opening ceremony and he also watched the first landing in the newly opened airport. The Congress submitted a bill that the airport is officially within Virginia and not Washington D.C. in 1945. The airport had undergone many improvements between mid-1960s to 1970s, including the establishment of a holdroom complex for United Airlines, American Airlines facility, and a commuter terminal was added. Washington National Airport was renamed to Ronald Reagan Washington National Airport under the legislation signed by President Bill Clinton in 1998. Due to the increased number of flights, they started to renovate and expand the airport during the 1990s. The new terminal complex was opened in 1997 band the main runway was lengthened in 2012. Advantage Washington Ronald Reagan National Airport - 2600 Jefferson Davis Hwy Suite A, Arlington, NV. Alamo Washington Reagan Arpt - Ronald Reagan Wash Natl Airprt, 2500 National Avenue Garage A, Arlington, . Avis Ronald Reagan Washington National Airprt - 2500 National Avenue, Arlington, . Budget Ronald Reagan Wash Nat'l Apo - 2500 National Avenue, Terminal Parking Garage A, Arlington, . Enterprise Dca Reagan Arpt - Ronald Reagan Wash Natl Airprt, 2500 National Avenue Garage A, Arlington, . Enterprise Arlington Shirlington - 2778 S Arlington Mill Dr, Arlington, . E-Z Washington Reagan National Airport - 2600 Jefferson Davis Hwy, Arlington, VA.
Hertz Washgtn Nat'l Ap - 1 Aviation Circle, Washgtn Nat'l Ap, . National Washington Reagan Arpt - Ronald Reagan Wash Natl Airprt, 2500 National Avenue Garage A, Arlington, .